Providing shear sharpening service for hair sylists. I promise and I deliver the finest scissors-sharpening service specifically for hair stylists and barbers. If you use Japanese hair cutting shears in your salon, then you know how important it is to keep them sharp. It takes training, and the right equipment to maintain both convex and bevel edges without destroying the radius of the Japanese shear's blade. I have both the training and the equipment. I guarantee that your shears will cut like they did when they were new. If I cannot sharpen your shears, you pay nothing. Before I go any further, let me point out what I do not sharpen. • I do not sharpen knives. • I do not sharpen fabric shears. • I do not sharpen pet shears that are either curved or longer than 7 inches. • I do not sharpen clipper blades. You're probably asking yourself. “Why should I trust Victory Shear Sharpening when all the other sharpeners I've used have produced mediocre results at best?” The answer is the Diamond Rose Superior Sharpening system I use, combined with my skill at what I do, and most importantly, my commitment to customer service. When I arrive, I will work inside your facility using the exact same equipment that I use in my workshop. I don't work outside from a truck in the parking lot. This is almost always an indicator of a scissor sharpener who uses the wrong equipment and the wrong techniques, and who will hand you back a scissor that may not perform properly. As a professional stylist, you already know the symptoms – a shear that can't slide, gives a crunchy cut, which pushes or folds the hair, or may not even cut at all. I receive many phone calls from stylists who tried to save a few dollars by using someone else who botched the job. They end up spending more money and they frequently have a scissor that has been severely damaged, or even destroyed. You probably know someone who has had this happen to them. Inside your salon, I will need a small work space with access to electricity. 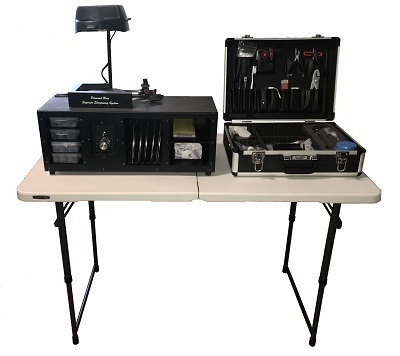 I prefer not to do any scissor sharpening at empty station shelves, on top of washing machines or counter tops, or anywhere else except the portable workstation (including a small table that the Diamond Rose Superior Sharpening system sits on) that I bring with me. I may sound like a sharpening snob, but this allows me to provide ultra–consistent sharpening by using the exact same positioning and lighting every single time. You will generally not hear a thing, and I promise not to leave any mess when I leave. You may even enjoy watching how it's done, and I enjoy answering questions about what I do. I also provide a broad selection of loaner shears (Musashi shears, which I also sell) for you to use while I’m working on yours so that you don't lose any productivity. Allow Victory Shear Sharpening to become your resource to keep all the primary tools of your trade in peak condition. Call or text today for an appointment. Do you have a pair of shears that no longer work because of what another sharpener did to them? Why not see if I can fix them. There are only two things I can't fix - a bent shear or a broken blade. You are a professional stylist or barber. You know that the tools you use directly affect the results you achieve. The best results for your clients occur when you use high quality shears that have been properly maintained combined with the skills you've developed in your profession. These kinds of exceptional results generate happy, loyal clients who in turn give referrals which help both you and your salons fill their appointment books, allow for increased fees and ultimately produce more income for everyone. Have further questions? Feel free to contact me and I will be glad to help. I charge $25.00 per shear but I do have a quantity discount. If there are five (5) shears or more, I will drop my fee to $20.00 per shear. This can be spread out throughout the salon. For example: one stylist has two shears that need to be sharpened, another has one, and another two. As long as it totals five shears or more the discount applies, it doesn't matter how many stylists that spreads across in your salon. I carry brand new shears with me, so a stylist can use one of mine while theirs are being sharpened. This ensures that there is no drop in productivity while I am sharpening. Contact me for details. I accept checks, credit cards, and cash. Call or text or email today for an appointment to have your shears sharpened. Keeping your shears in good working condition.